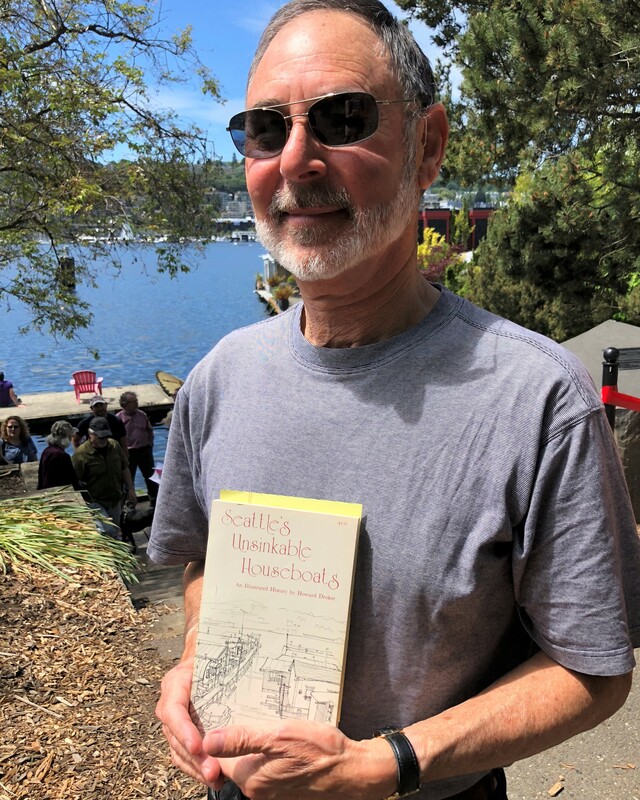 Terry Pettus moved onto a houseboat in 1958 and later played a crucial role in saving Lake Union’s houseboats and in preventing the city from dumping directly into the lake. 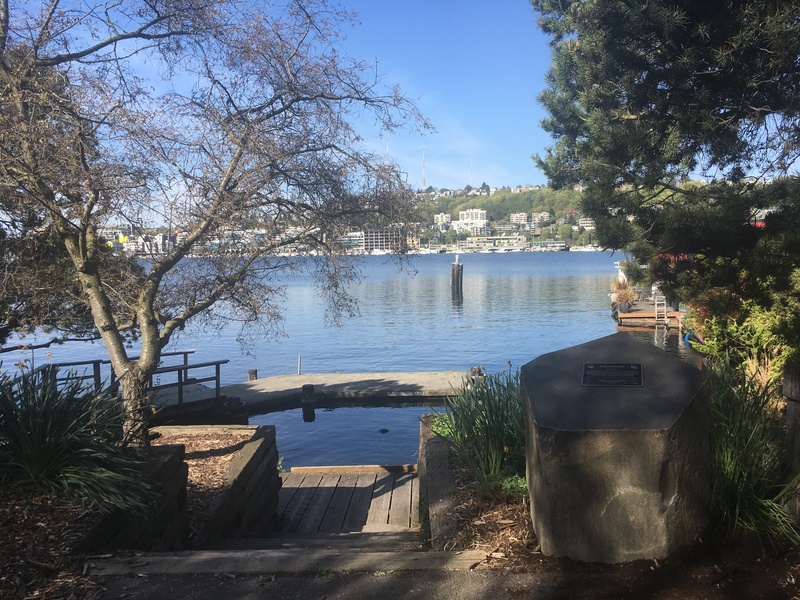 Seattle mayor Charles Royer honored him in 1982 with an official Terry Pettus Day, and in 1985, the year after his death, the city dedicated the small Terry Pettus Park on the shore of Lake Union near one of the houseboat neighborhoods. John de Graaf is a documentary filmmaker who has produced more than a dozen prime-time national PBS specials and has won more than 100 film making awards. The John de Graaf Environmental Film making Award, named in his honor, is presented each year at the Wild and Scenic Film Festival in California. His first documentary was a film about Terry Pettus, a Seattle activist who played a crucial role in saving Lake Union’s houseboats. In September of 2017 my nephew who was visiting me from New York was interested in seeing the Terry Pettus Park. When we arrived at the park, I was stunned at the condition it was in. At first I just wanted to replace the sign at the park hoping to add some details about Terry’s life with a different style of sign. I sent photos to the park department, and the upshot of that is the parks dept. was extremely surprised at how badly deteriorated it had become – it had fallen through the cracks. I spent months with various officials discussing options. Turns out the type of sign they use is called a “Rainbow sign” and no words can be on it; all park signs have to be uniform. 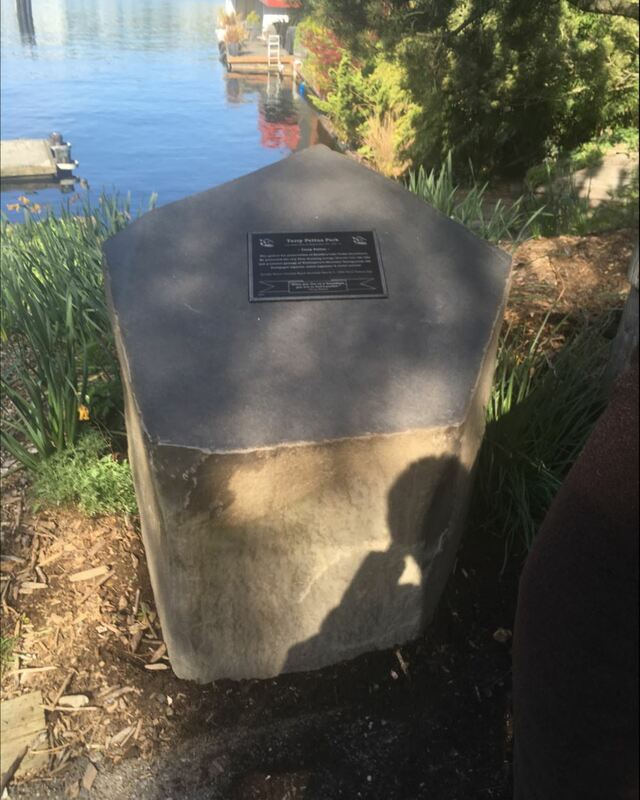 Then we discussed the idea of a plaque which would have to be attached to a boulder that could be moved during the remodel of the park. 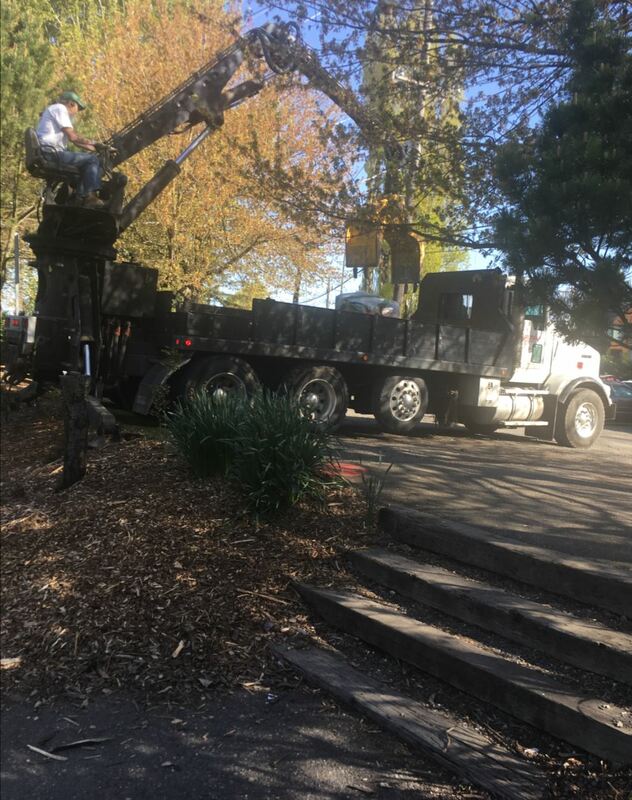 Due to the photos I sent to the city, they now have “short term” and “long term” plans to do a major remodel of the park. The long term plans are going to be fantastic – cement steps with a railing for a starter. Hopefully a water system will be installed– there is a question as to whether or not water is present and is hidden, or non-existent, that is in research at the present. 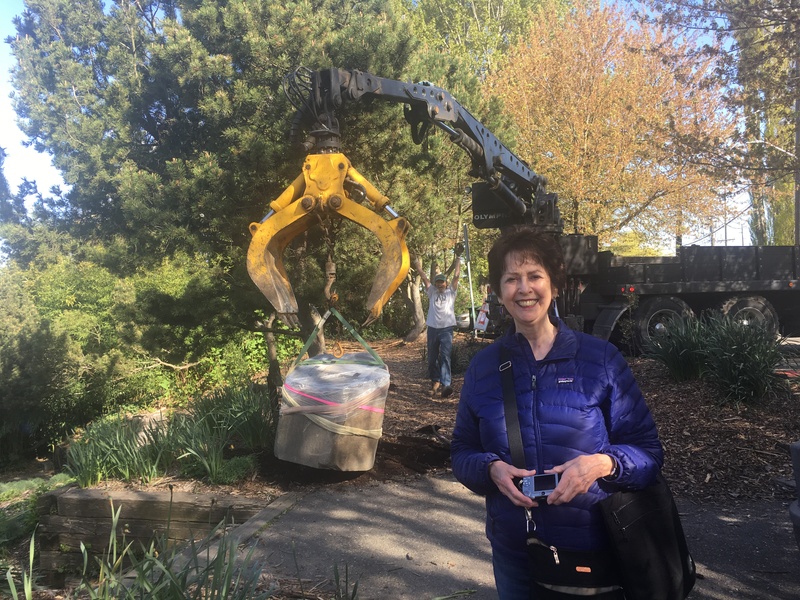 The short term plans include shrubs being planted in the park and the Terry Pettus Park sign will be replaced with a newer style. 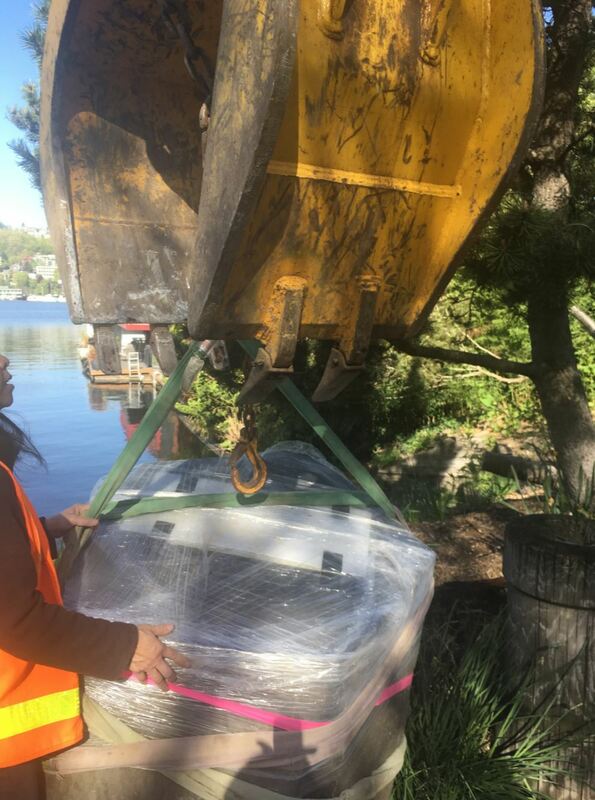 I have done the research and Mark Peek, who lives on a houseboat at Tenas Chuck part time, is financing the project through the Pettus Trust. 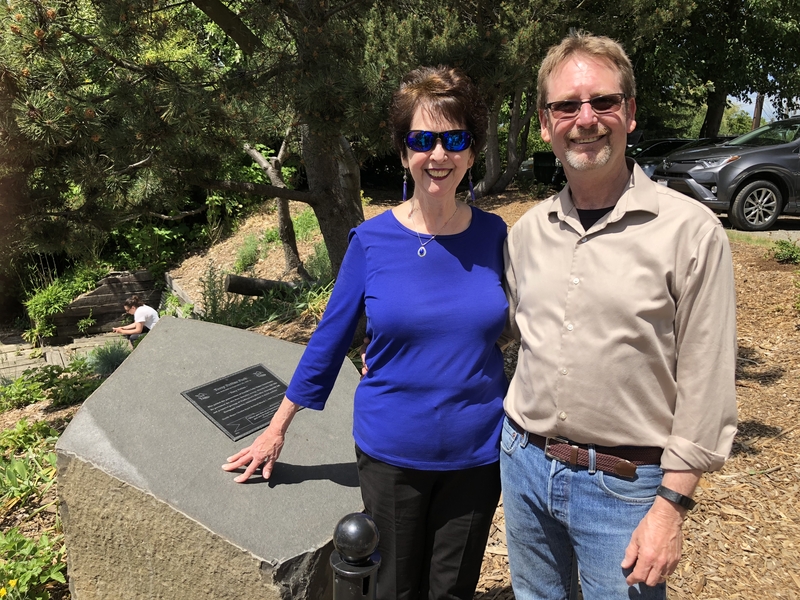 The plaque was unveiled in a ribbon cutting ceremony on June 2nd, 2018 which 50 – 60 people attended. Bill Johnson (Dixie’s son) acted as MC and introduced the speakers at the ceremony. John de Graaf who produced the “Documentary Subversive” spoke about his experience with Terry with some stories we had not heard before that got a lot of laughs. Howard Droker author of “Seattle’s Unsinkable Houseboats” spoke about Terry and his time with him in writing the book, and what a remarkable man he was and all he did for the City of Seattle, and more. Ann Prezyna and Chris Lehman from the Eastlake Community Council spoke about Terry’s help with Eastlake in the beginning years. 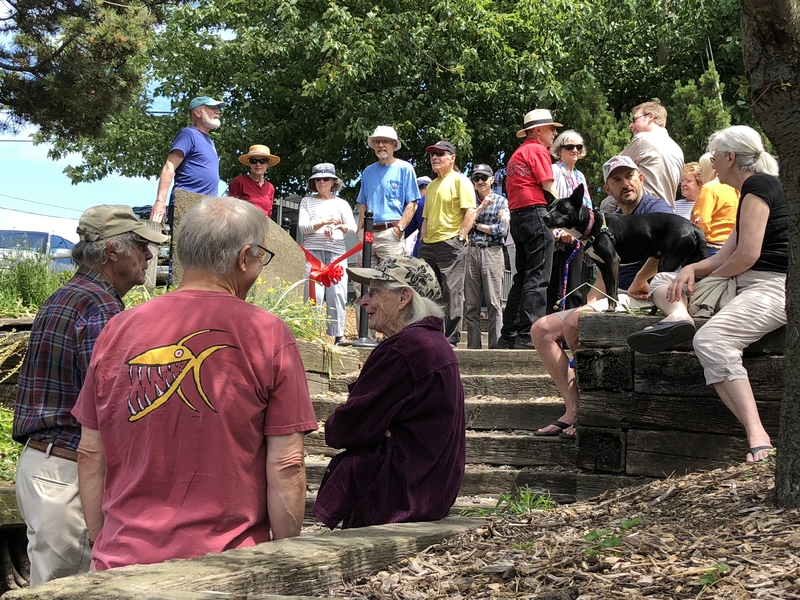 At the end, Dixie spoke about her positive experience with everyone at the Park Department, and how helpful they had all been to her in the creation of the plaque/ boulder. The theme that day was how extremely positive Terry’s influence in Seattle was. In addition there is a very deep interest in interpretive signage, explaining more about his contribution to Seattle and his many other accomplishments. 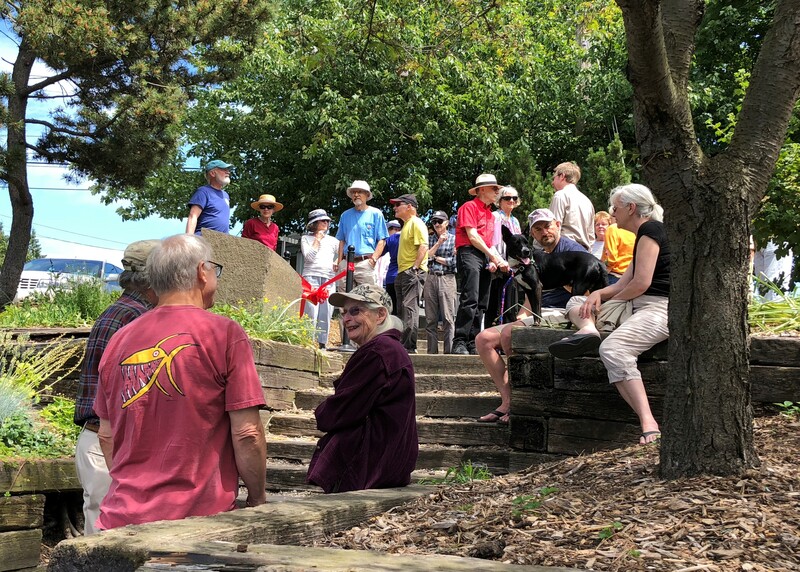 The crowd was enthusiastic about the next plans for the complete remodel of the park, that hopefully will begin soon.